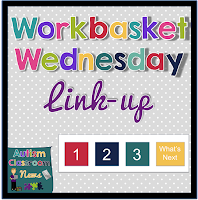 I am so excited to be linking up with Autism Classroom Resource for Workbasket Wednesday! If you haven't checked out Autism Classroom Resources yet you should! Click on the picture and it will take you to her wonderful site! Last year when I started Work Jobs I was in an ECSE classroom and I am so passionate about this as I saw how my students thrived and how independent they became throughout the year. This Wednesday I will be blogging about color sorting workbaskets! Here are some of my favorites! I went to the Dollar Tree and bought a bag of pony beads and then needed to figure out what to do with them! A great color matching and fine motor task was to put pony beads on corresponding pipe cleaners. Depending on students I would only put a few pony beads in the box. I had a lot of pony beads left over so I decided to use them again! This time I use these small containers at the Dollar Tree (there were 9 in the pack!) and glued a color bead on the bottom of each container as well as the top so students knew where the beads were intended to go. Thanks for checking out my blog and I hope you found it useful! To hop on back to the blog click here!